When you first start playing Rummy, you may find that putting your cards into combinations is quite challenging. The best strategy is to aim for melds that have the best chance for completion. The cards in your hand and on the table give you information about your chances for completing certain combinations. For example, if you can keep only two cards from the 7 of spades, 8 of spades, and 8 of clubs, and you’ve already used the 8 of diamonds in another run, you should keep the spades because you have two chances for success this way — the 6 of spades or the 9 of spades. Keeping the two 8s gives you only one possible draw, the 8 of hearts. Another typical problem is knowing when to break up a pair in order to increase your chances elsewhere. For example, imagine that you have to discard from a collection such as the one shown here. Time to choose or lose. The solution to this problem is to throw the 10 of hearts away. 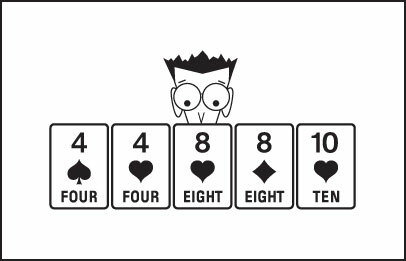 Keeping your two pairs gives you a reasonable chance to make three of a kind, and the 10 of hearts gives you only a single chance of making a combination — by drawing the 9 of hearts. In general, you don’t want to split up your pairs. But life (or at least Rummy) isn’t always so simple. Suppose that you have the cards shown here. Dismantle a pair and perhaps draw a building card. If you need to throw out one card, throw a 4 away. The 7 of spades is a useful building card, meaning that it fits well with the 8 of spades; mathematics says that the nest of 7s and 8s gives you four possible cards with which to make a combination (the 9 of spades, 6 of spades, 8 of clubs, and 8 of hearts). You have the same number of options if you throw the 7 of spades away and keep the two pairs. But the real merit in throwing away one of the 4s is the degree of freedom you attain for a future discard. By throwing one 4 away, you allow yourself to pick up another potentially useful building card (such as the 7 of diamonds) at your next turn, and then you can throw away the other 4. By contrast, throwing away the 7 of spades fixes your hand and gives you no flexibility. The odds favor your draw to the run rather than your hopes for a set. When you make a run, you can build on it at either end. A set, on the other hand, has only one possible draw. For this reason, be careful about which cards you discard. If you must give your opponent a useful card, try to let her have the sets of three or four of a kind instead of helping her build her runs. You can’t go through a game of Rummy thinking only about the cards in your hand — you also need to watch the cards thrown into the discard pile. Monitoring the discard pile helps you keep track of whether the cards you’re hoping to pick up have already been thrown away. For example, if you have to keep two cards from the 7 of spades, 8 of spades, and 8 of clubs, consider whether the 6 of spades, 9 of spades, or 8 of hearts has already been discarded. If both spades have already gone, you have no chance of picking them up — at least not until you work your way through the entire stock, at which point you may get a second chance at the cards when the deck is reshuffled. 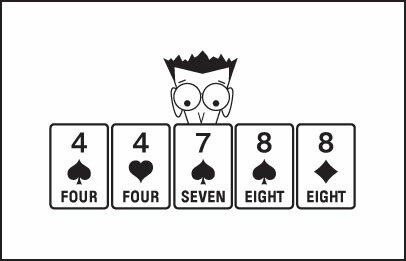 In such a stuck position, you should settle for a realistic chance, however slim, of picking up the last 8 by discarding the 7 of spades. Try to avoid drawing to an inside run — keeping, for example, a 3 and a 5 in the hopes of drawing the 4. Holding onto builders (cards that may be helpful elsewhere) is better than relying on a single card. You can’t review the discard pile for clues. You have to remember which cards were thrown away — or be very adept at taking stealthy peeks at the discarded evidence! Contemplating what your opponent has in his hand helps you make smarter choices about what cards you should discard. After all, you don’t want to throw away that king of hearts if your opponent can use it to complete a run with the queen of hearts and jack of hearts. You compile a picture of your opponent’s hand by reading the negative and positive messages you get from his plays. For example, if you see your opponent throw away the queen of hearts, you can be sure that he isn’t collecting queens. That information in itself doesn’t make discarding any queen safe, however, because he may be collecting high diamonds. But if do you subsequently throw down the queen of diamonds, and he picks it up, his action provides you with an informative message; you can safely infer that he’s collecting high diamonds. Early in the game, try to avoid discarding exactly the same rank of card as your opponent; he may be trapping you. For example, if you hold the jack of clubs, queen of diamonds, and 10 of diamonds, you may be able to persuade your opponent to let his jacks go by tossing your jack of clubs at the first opportunity. This trick is good strategy — so try it yourself, but be aware that your opponents may be on the ball, too. Kings are the most attractive discard, followed by queens, because fewer runs involve kings and queens than involve jacks or 10s. (Kings can only appear in K-Q-J runs, but jacks can appear in runs of K-Q-J, Q-J-10, and J-10-9.) Of course, discarding court cards reduces your potential exposure if you lose the game. The higher the card, the more points you may present to the player going out. Another critical strategy dilemma in Rummy is whether to pick up builder cards — cards that lend themselves well to combinations — from the discard pile. Say, for example, that you start the hand with the queen of spades and jack of diamonds, and early in the game an opponent throws away the queen of diamonds. Should you pick it up? You would automatically keep the queen of diamonds if you picked it up from the stock, of course — doing so doesn’t give your opponent any clues as to which cards you may find helpful. But if you take a card from the discard pile, you tip off your opponent to part of your hand. If you’re playing against a good player who carefully watches cards, you probably shouldn’t take the builder card. On the other hand, picking up a card that multiplies your options, such as the 7 of hearts with the 7 of spades, 8 of spades, and 8 of hearts in your hand, is definitely a good idea because the 7 of hearts gives you some flexibility in two directions. Along with your opponents, you should watch the discard pile like a hawk. Technically, the cards should be arranged one on top of another, but in reality, you can generally see many cards below the top card. Crafty opponents keep a sharp eye on the pile; so should you. Try to remember the cards that haven’t been discarded as well as the ones that do appear on the discard pile. If you’ve almost worked your way through the entire deck and you see your first 5, assume that your opponent is collecting them — if your opponent isn’t interested in collecting 5s, you probably would’ve seen a 5 before reaching the end of the deck. Assume that your opponents are honest until they prove you wrong. If they hesitate on your discard, assume that they want to pick it up; their possible need for that card may affect your future discards. If you subsequently discover that they simply paused for effect, say nothing, but remember that they may do the same thing next time. You should be able to draw the right inferences after observing the first performance!